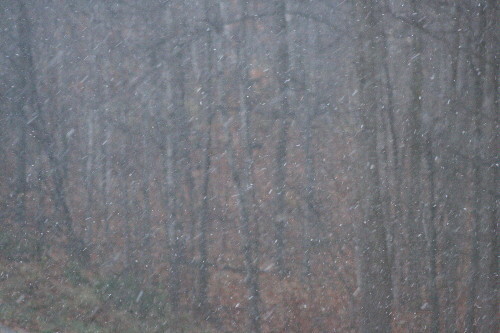 We got our first snow of the winter this afternoon. A large storm system rolled through much of the northeast, with portions of eastern Ontario, western Quebec, New York and surrounding areas bearing the brunt of it. If it had been the middle of winter we may have ended up with a few inches of accumulation on the ground in some areas. 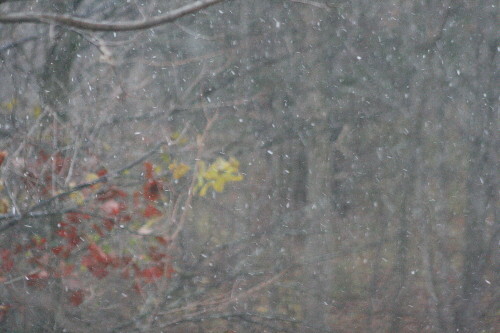 As it was, being the tail-end of fall, the ground was still warm enough to melt most of the snow before it accumulated. As of now (midnight) the ambient temperature has finally dropped to freezing, and some surfaces are cold enough to collect a light dusting, including the deck railing and my car, though it still melts on the ground. It creates a funny pattern, like someone deliberately dusted these surfaces in preparation for some fancy Christmas party. 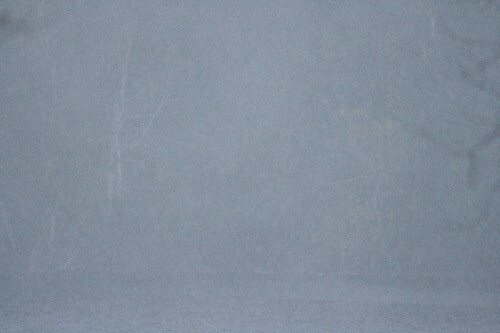 At some points this afternoon it was falling so thickly that it obscured the park on the far shore of the lake, except for the white birches that shone through. It’s about the right time of year for our first snowfall – not too early that we’re cursing, not too late that we’re wondering where it is. I recall a few Hallowe’ens growing up where we went trick-or-treating with a light cover of snow on the ground. There may be a little of the snow left over tomorrow morning, but I suspect it won’t last very long. It looks like the last of the system has nearly moved out of our area, so we’re unlikely to accumulate much more. It snowed here in downtown Toronto this morning while I was playing fetch at the dogpark. It stuck to my fuzzy fall jacket, if not the ground. It is exciting, and invigorating, at least for the first month.